The holiday home “The Door” of Mignana is situated in the country of the city of Vinci, famous all over the world as it was the birthplace of the genius Leonardo. The facility, totally plunged in the Tuscan country, consists of five residences in old stones, with fittings in precious chestnut wood and with a floor made in terracotta tiles. The Porta di Mignana ancient gateway to the Barco Reale Mediceo: with the relevant estate, it is set in a scenic area. The Barco Reale Mediceo was a game reserve of hunting and farming-forestry products of the Medici family, grand dukes of Tuscany until 1738, entirely surrounded by a stone wall, a few remains are still visible inside the estate. Plunged in the peace of an unpolluted nature, “The Door” of Mignana offers its guests a breathtaking view, that stretches out as far as the eye can see through the valleys of Empoli, San Miniato and Vinci letting everybody make out Livorno, the Tyrrenian See and Gorgona Island. A stay at “The Door “ of Mignana let you so plunge in the rural Microcosm of Tuscany, coming totally in the traditional surroundings of the country, live the rhythms of the ancient rustic life, finding again in this calm and silence the best antidote against the stress of modern life. The apartments. Cosimo il Vecchio: two rooms: a dining room-lounge area with armchair and sofa bed and kitchen with cooking corner, double bedroom and bathroom with shower. The apartment is completed by a corner fireplace in ancient stone. Leonardo: two-room apartment consisting of a dining room-lounge area with cooking corner and loft, double bedroom and bathroom with shower. Lorenzo il Magnifico: access is through a covered portico. The ground floor has a large dining area with kitchen and fireplace, a roomy lounge area with window onto the portico, a sofa and sofa bed. The night zone on the first floor has a double bedroom, a bedroom with two single beds and two bathrooms, with shower and hydro-massage bath. Antico Fienile: two-room apartment consisting of a dining room-lounge area with cooking corner, fireplace and sofa bed, bathroom with shower and loft, where the night zone is located, which is accessed by a wooden and iron stairs. 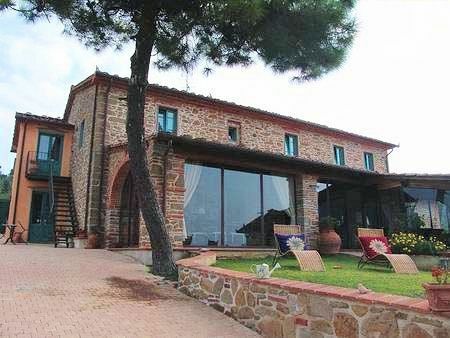 Casotto dei Birri: two-room apartment consisting of a dining room-lounge area with cooking corner and sofa bed, bathroom with shower and loft with night zone.Externally there is a small independent farmyard. Fuimos este pasado verano a la Porta Mignana y nos encantó el lugar. El sitio es excepcional para tener tranquilidad y a la vez está muy bien ubicado. El trato de Filomena lo mejor, siempre con una sonrisa y a tu disposición con sus detalles de cada mañana. Los niños se lo pasaron en grande con la piscina y con el entorno que proporciona la casa. Sin duda un buen lugar para ir de vacaciones. Gracias por todo Filomena. Todos te hechamos de menos.